Welcome to our first newsletter for 2017. We are so excited that we now have a community of more than 900 libraries on the eSmart journey with us! We know that this year’s bi monthly newsletters will be full of fabulous library tales and stories of digital literacy champions! . The University of Western Sydney has released an independent report praising the Alannah & Madeline Foundation's eSmart Libraries program. The user Wave Two survey of over 500 people not only provides evidence of eSmart’s outstanding behaviour change results but also some tremendous general feedback from librarians, library users and council staff. Following on from eSmart Libraries Wave One independent evaluation in 2015, Wave Two has now concluded, with outstanding results and practical digital implications for libraries and their communities. The Executive Summary within the evaluation report, conducted by Western Sydney University, outlines the findings and shares case studies on the program’s implementation success across the nation. At the end of last year, Albany Public Library, WA was proud to become an eSmart Library, having introduced an outstanding Internet Use Policy and incorporated cyber safety in a variety of presentations, workshops, handouts and tech sessions for their community. 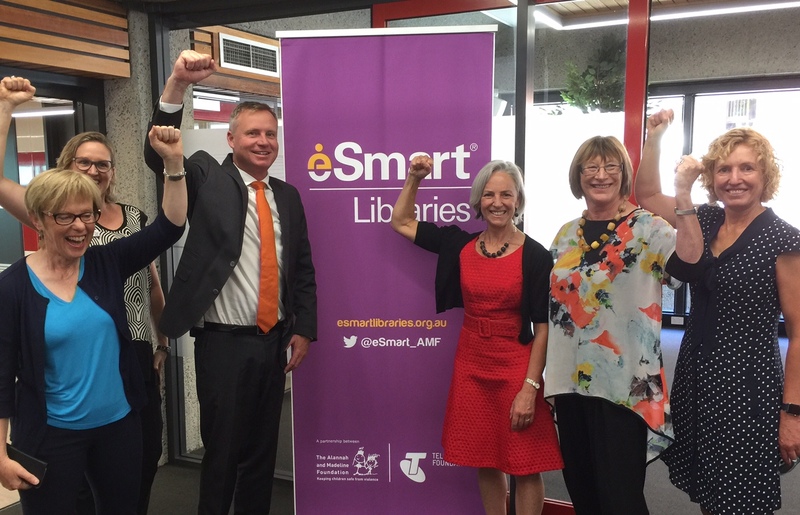 Hobsons Bay Libraries, VIC celebrated becoming eSmart in December with the launch of their Learning Communities Strategic Plan. Congratulations to Paula Kelly and the team for embracing the digital challenge in one of Victoria’s growth corridors. Congratulations also to Gympie Regional Library Service, QLD who were the first in 2017 to achieve eSmart status. It took them just over a year and the team are now awaiting eSmart signs to display in each of their six branches. Adelaide City Council Library, SA plans to widely announce their eSmart status through the display of oversized banners in their library. Last year the team partnered with ThinkUKnow during National eSmart Week to host presentations for parents about online privacy and security for young people. Shire of Dardanup, WA became an accredited eSmart library last month and strengthened their local connections by creating combined events and workshops to engage with young people, parents and children, as well as older community residents. We thought January was a quiet time in libraries for eSmart matters! We would like to heartily welcome the following libraries who are now on their way to becoming eSmart. View a full list of participating libraries here. Shire of Dardanup made great connections through their local council to increase awareness around being safe online within their community. View this excellent Summary of Engagement to assist you through Domain 5. City of Albany’s thorough Public Internet Use Policy can be used to update your own Internet and WiFi Policy (Action 2.3). Adelaide City Council presented a highly visual eSmart Libraries Briefing Presentation to their staff. You can use the content for your own eSmart Induction (Action 3.1). 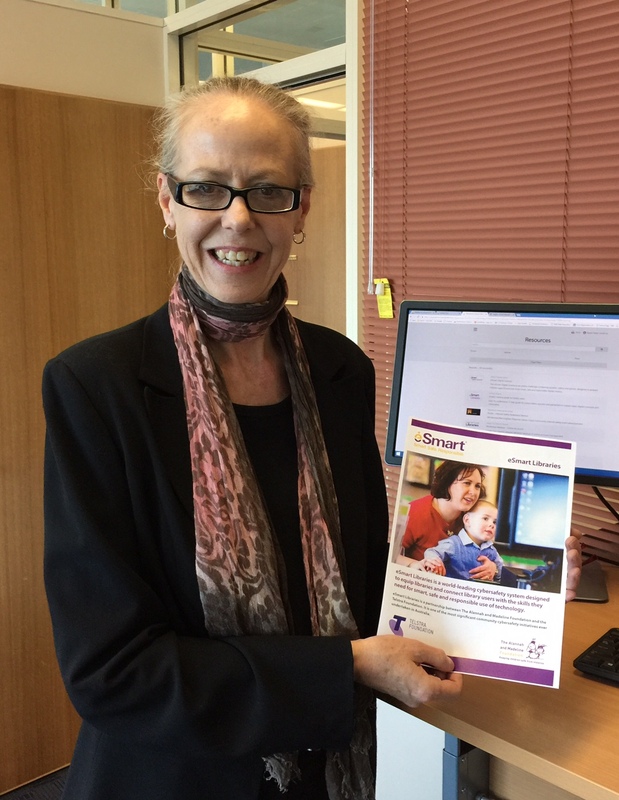 Especially for libraries in Victoria, East Gippsland Shire Libraries identifies How eSmart links to Council policies, plus ALIA and PLVN’s current Strategy (Action 1.3). Fremantle City Library, WA and Campaspe Regional Libraries, VIC have jointly received the Network Partner Award by Go Digi for their work in Digital Literacy. Here’s a snapshot of the sessions held at Fremantle and the positive impact on their community. Go Digi is a partnership between Australia Post and Infoxchange. The national campaign is a four year digital literacy program whose goal is to support more than 300,000 Australians to improve their digital literacy skills. Go Digi welcomes you as a learner, mentor and partner. Yarra City Libraries, VIC has built a great visual graphic from the picture books their Children’s Librarians use during eSmart storytimes.Take a look at this Piktochart for the titles. Following the launch of a new library website, Yarra City Libraries would like to add more titles to the list. If you have a favourite of your own please send it through and they will publish an updated list soon. The Foundation is excited to launch its new Connect program that is designed to help upskill communities in relation to cyber safety, bullying and the impact violence has on children and young people. Utilising the expertise from our evidence-based programs, the Foundation has established AMF Connect, a service that provides a range of informative workshops and seminars on topics related to cyber safety, bullying and care. Connect workshops are available to all libraries who would like to offer this format to staff and the broader library community. The workshops run for 60 minutes and are tailored to suit a range of different ages and audiences. The cyber safety workshops are aimed to complement the work libraries currently undertake to become an eSmart accredited library. Prices start from $500 (plus GST) with a 10% discount for libraries who are registered for eSmart Libraries. We are celebrating Safer Internet Day (SID) by offering a further 10% discount to libraries booking a workshop. The discount is still available until 19 February. For registered eSmart Libraries this means a total introductory discount of 20%! In December 2016, the Alannah & Madeline Foundation launched a very successful campaign in conjunction with Telstra, for parents who were thinking of buying their children a smart phone for Christmas. The messages are relevant for children starting a new school year too. Feel free to share these messages with your community now. 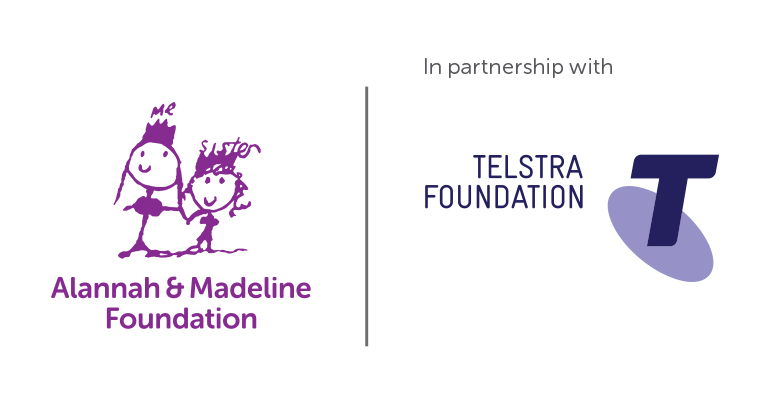 The Alannah & Madeline Foundation and Telstra are passionate about the smart, safe and responsible use of technology, and ensuring children are using their device safely is vital. Since becoming eSmart last year, West Gippsland Regional Library Corporation, VIC have arranged five free cyber safety presentations in February and March at various library locations. Greg Gebhart from the Office of the Children’s eSafety Commissioner will be presenting on the latest cyber trends, stats and information and everyone is welcome to attend. Book your place soon as these events are well attended. Digital Taxonomy – this is a creative summary of apps and web tools to better leverage technology in digital training sessions. Some will be familiar whilst others are new. The Pedagogy Wheel classifies more than 100 apps using a variety of verbs and activities, generating interest and discussion amongst students. 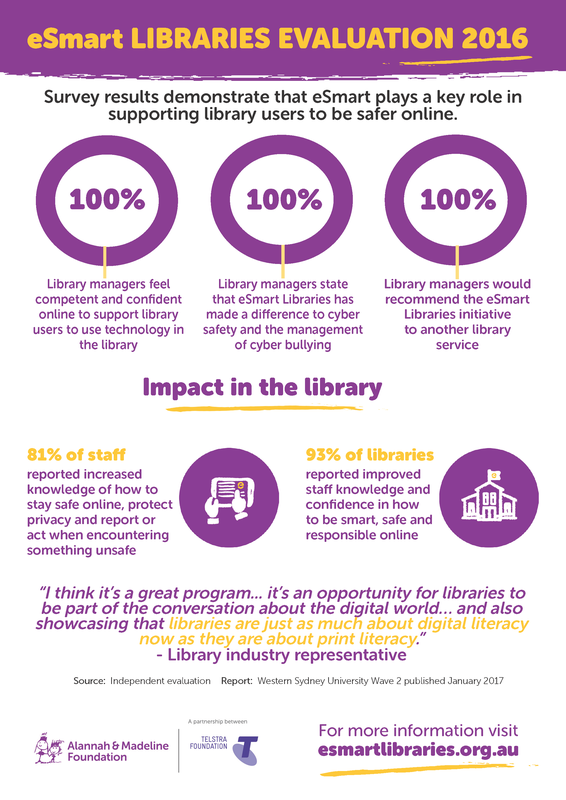 LINC Tasmania had already identified cyber safety and digital literacy as a critical part of community engagement with their library patrons. They had many best practice policies in place already in their library service and prioritised training for staff as key to upskilling their metro and regional communities. Robyn Murfet (pictured left) identified access to library resources as the most valuable support tool in the eSmart portal and continues to prioritise training to address learning gaps for staff and users. Read more here. Stay Smart Online (SSO) has been reminded to be wary of suspicious emails following a warning that scammers are targeting users of the Australian Securities and Investments Commission’s (ASIC’s) registry services. ASIC has warned that scammers are sending some business registry service users emails with attachments or links to fake invoices. The scammers are attempting to deceive users into thinking the emails come from ASIC itself. See full story here. Also from SSO, security researchers have reportedly identified malware that pretends to be an Android version of the popular game Super Mario Run. People trying to install the game instead infect their mobile device with malware known as Marcher that endeavours to capture personal financial details. Source: January Stay Smart Online newsletter. The eSmart team continues to be available to visit libraries around the country for eSmart introductory and ongoing training sessions. Working Groups are welcome to request a support visit at any time, especially if you have new members or have hit a snag. Visits are scheduled to Western Australia and Queensland in February, and South Australia in March so email us now to arrange a support discussion or a training session either face to face or via a webinar. Launched in August 2012 by the former Prime Minister of Australia, the Hon. Julia Gillard MP, our $8 million, multi-year partnership with the Telstra Foundation is delivering eSmart Libraries. The Framework is being provided in collaboration with Australia's library network over six years to all of Australia's 1,500 public libraries for free. This eNewsletter is primarily distributed to eSmart Coordinators and branch champions. If you would like to add a colleague to the list, please email us.